CodeTwo Exchange Rules 2003 lets you archive mail processed by the Exchange server in EML files. It also enables choosing the type of files to be archived as well as the location and name format for archive files. You can archive all mail traffic (regardless of the footer being added), namely messages sent outside the organization, internal messages and incoming ones. To view the archiving tool, in the main program screen choose Tools and Archiving. In the Message types section you can choose which messages will be archived. The options to choose from are Outgoing and Internal/Incoming. The program does not telle the difference between internal and incoming messages. To choose the relevant type, check the appropriate box. Fig.1. The archiving tool saves the messages processed by the server. Archive folder section appears dimmed as long as you do not choose a message type to be archived. When we have specified the message type(s) to be archived, you can make changes to Archive folder section. In this section you can choose the location for archive files. 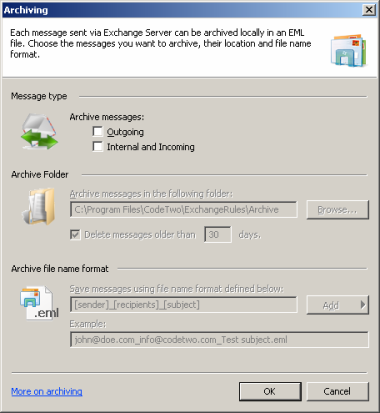 By default, the messages are stored in the installation folder in Archive folder. Internal and incoming messages are stored in Archive\Internal and Incoming, and outgoing messages are stored in Archive\Outgoing. To change the location of the archive folder, click Open and choose the destination folder or create a new folder by clicking Make New Folder, specifying its location and confirming with OK.
Fig.2. Once the message type for archiving has been selected, the other sections become active. The archive folder stores messages processed by the server. But the mail server may process thousands of messages daily and with each message a new archive file is created. To avoid cluttering your archive folder, use Remove old messages option. To have the old messages removed automatically, checked the box Remove messages older than X days and specify the number of days after which the messages will be deleted (Fig.3). If the option is cleared, the program will never remove old messages. Fig.3. Specifying the number of days the messages are kept in archives. To keep the changes, click OK in the Archiving dialog box and remember to click Save in CodeTwo Exchange Rules 2003 toolbar. 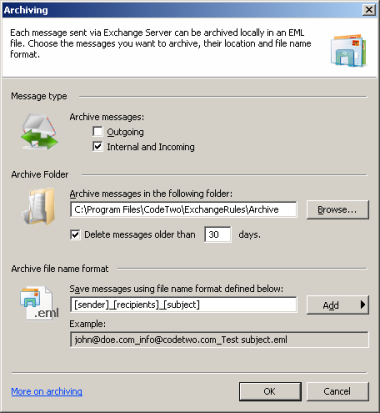 EML files can be opened using Outlook Express. Microsoft Outlook does not support such files, though.